Hotlink has introduced a new plan under its Postpaid Flex family called the Flex Plus 60. 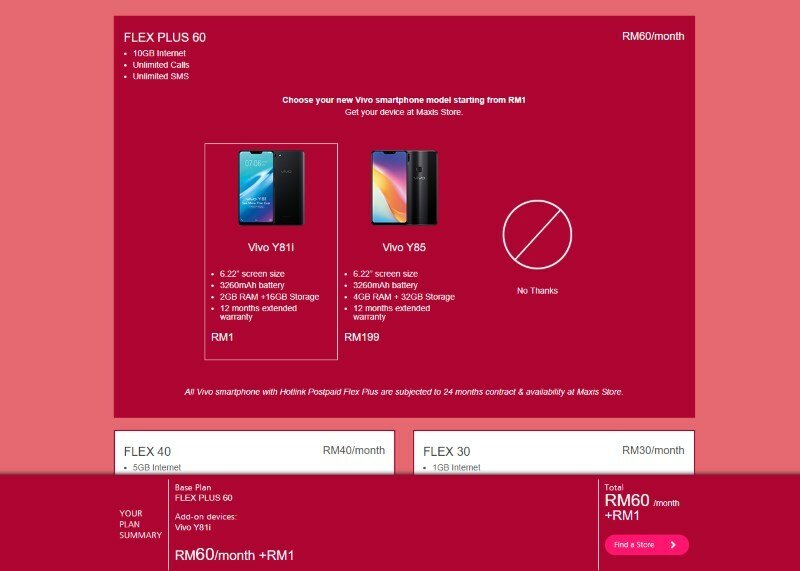 Prior to this, there were already two Hotlink Postpaid Flex plans in the market including the Flex 40 and Flex 30. Priced at RM 60 per month, customers would receive 10GB of Internet alongside unlimited calls and SMSes which were standard features for Hotlink Postpaid Flex plans. Additionally, they also can choose to add Unlimited Social, Unlimited Music, and Unlimited Chat packs into their plan for an additional fee. Aside from the bigger data quota, another major factor that separates it from the previous Postpaid Flex plans is the fact that it is the only Postpaid Flex plan that offers phones. While there are only two models available with the plan, the price could be quite attractive to some customers out there. For example, the vivo Y85 which currently priced at RM 899 is being offered through the plan for just RM 199. On another hand, there’s also the vivo Y81i which is being sold for RM 499 at the moment can be obtained alongside the Postpaid Flex Plus 60 plan for additional RM 1. However, do note that these phones come with 24 months contract. To learn more, check out Hotlink’s official website or visit the nearest Maxis Store.